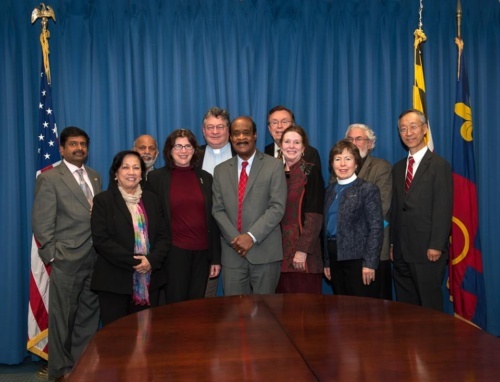 It is the responsibility of FCAC to advise the county executive on the needs and concerns of faith communities that worship and serve others in Montgomery County, including on land use issues, policy initiatives, budget priorities, response to emergencies and acts of hate and violence, intervention and prevention of violence, integration of immigrants, healthcare for all, and other partnership opportunities. 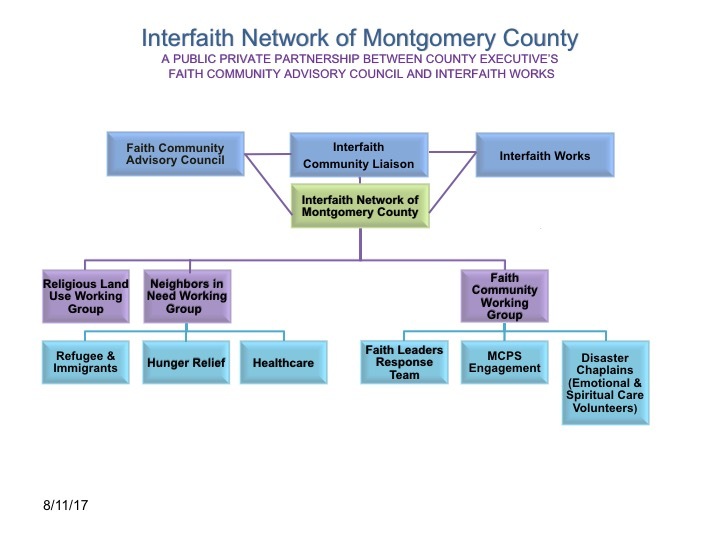 FCAC works to identify all faith communities worshipping and serving others in Montgomery County to establish effective communication and encourage collaboration among themselves, government offices, and human service agencies for the benefit of all. 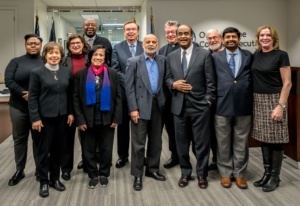 The members of the Faith Community Advisory Council and its executive committee, working groups, and committees are comprised, as much as possible, of the full spectrum of faith communities. This includes clergy and governing leadership of faith communities, as well as religiously based nonprofit organizations. Since the FCAC works directly with the community on a variety of tasks, it is necessary that members possess the needed expertise to execute the tasks. Due to need for expert opinion across a range of topics and issues of concern to faith communities, the county’s prohibition against serving on more than one county board, committee, or commission does not apply to FCAC members. FCAC is led by co-chairs designated by and who serve the county executive. One co-chair rotates each year to achieve the model of both balanced and shared leadership. The executive committee consists of the co-chairs of FCAC, the chairs of the working groups, and others as deemed appropriate by the county executive. The chairs of working groups and committees are designated by the interfaith community liaison. They serve two-year terms and are eligible for reappointment to a second term. The committees under the working groups are overseen by a chair of the appropriate working group, the interfaith community liaison, or someone designated by them. The county executive meets periodically with FCAC to elect the co-chairs of the executive committee, set policy, and provide oversight. The executive committee sets the dates and agendas for FCAC meetings. The executive committee establishes working groups consistent with fulfilling its purpose and tasks. The executive committee adopts rules to ensure the orderly transaction of its business consistent with the stated purpose and tasks assigned to it. The mission, goals, and action items of the working groups are in separate documents and available to the public. FCAC meets at least quarterly. The executive committee meets at least bimonthly. The working groups and committees set their own schedules. The county executive’s Office of Community Partnerships is responsible for providing public notice of the time and place of meetings and maintaining a public record of attendance and summary of actions taken. Meetings of FCAC are open to the public except for discussions allowed to be held in executive session pursuant to county law.